Aluminum Wheels, Cruise Control, Bluetooth, Rear View Camera, MyLink! The city moves fast and so do you. Adeptly maneuver through traffic with ease with your Spark as your tour guide. 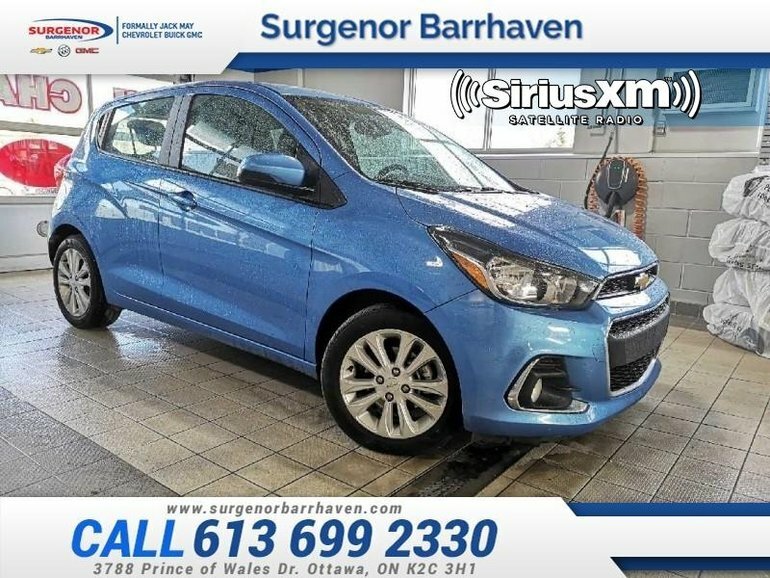 This 2018 Chevrolet Spark is for sale today in Ottawa. The 2018 Chevrolet Spark is the perfect car for any city commuter. It is agile, fun to drive, and perfect for navigating through narrow, busy city streets or parking in that great spot that might be too tight of a fit for any other car. It is surprisingly spacious and offers plenty of cargo room plus it is loaded with the latest in technology to make your drive even more fun. This hatchback has 22377 kms. It's splash metallic in colour. It has an automatic transmission and is powered by a 1.4L I4 16V MPFI DOHC engine. This vehicle has been upgraded with the following features: Aluminum Wheels, Cruise Control, Bluetooth, Rear View Camera, Mylink, Siriusxm. It has some remaining factory warranty for added peace of mind. Our Spark's trim level is 1LT. This Spark might be compact, but when it comes to technology, this ride is filled with features such as 15 inch aluminum wheels, Chevrolet MyLink radio with a 7 inch colour touch-screen, rear vision camera, bluetooth streaming audio, power windows and locks w/ remote keyless entry, air conditioning, SiriusXM radio, cruise control and steering wheel mounted audio controls plus much more. Buy this vehicle now for the lowest bi-weekly payment of $93.16 with $0 down for 84 months @ 6.99% APR O.A.C. ( Plus applicable taxes - Plus applicable fees ). See dealer for details. Interested in the 2018 Chevrolet Spark 1LT - Aluminum Wheels - Cruise Control - $93.16 B/W ?